The debate over software patents has now raged for decades, with no sign of slowing down. Last June, the eyes of the software industry were trained squarely on the Supreme Court when they handed down the decision in Bilski v. Kappos, a case with significant implications for the patentability of software. To the disappointment of many anti-software patent crusaders, the Court found against Bilski but failed to set a wider precedent and strike down business method or software patents in general. Proponents of software patents claim that legal protection encourages economic growth, job creation, and protection for innovators. However, more and more entrepreneurs, investors, and even large corporations have come to disagree with this view, realizing that software patents often impede invention, result in costly legal battles, and are used as bully sticks by competitors or non-practicing patent trolls to extract expensive licensing fees and concessions. Property rights are a vital component of modern society that allow markets to function and economies to flourish. Intellectual property rights lend legal protection and recourse for ideas, designs, art, and writing and their owners, and are particularly important to foster a culture of innovation. Time and again, studies have demonstrated that stability and predictability in legal systems encourage economic growth. Few countries in the world have been as entrepreneur friendly than the United States ove the course of the last century. However, as the rate of technological innovation has increased, our nation’s legal framework has not kept pace. The U.S. Patent system is sadly outdated, and ill designed and poorly equipped to handle the inventions of a software age. The idea of patenting “one-click” checkout on an e-commerce site or a means of “determining and displaying relationships between individuals who have entered personal information” seems ridiculous, yet Amazon and Friendster hold patents for these particular online functions. The 2008 Berkeley Patent Survey, which interviewed over thirteen hundred startups (more than seven hundred of which were software companies) showed staggering results that run counter to traditional academic beliefs regarding patents. The study reported “in general, the technology startup executives responding to our survey report that patents offer relatively mixed to weak incentives to engage in innovation.” Surprisingly, the study found that only 24% of software firms had even bothered to file a patent, and showed that many industry executives saw little value in spending time and money for what amounts to minimal defensibility. While the benefits of software patents are disputed and somewhat unclear, the costs are certainly quantifiable. 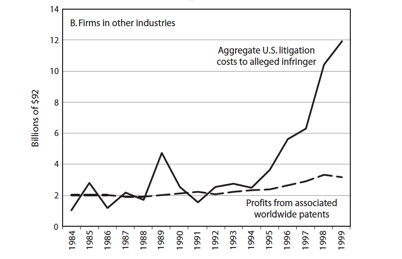 According to a 2008 report from an insurance industry trade organization, software firms bear major costs of litigation associated with securing and defending intellectual property – amounting to over $11 billion per year, which vastly exceeds the profits from the products disputed in those patent cases (see figure below for profits vs. litigation costs for software patents). The United States Patent system is not adequately coping with the realities of modern innovation, resulting in uncertainty, long delays, and high cost litigation. While the United States has long been the world leader in innovation, in order to remain so patent law will need to adapt for modern inventions and developments in software. While there has been talk for many years about a major patent reform bill, and in recent days both the House and the Senate have put forward versions of the “Patent Reform Act of 2011”, neither draft of legislation takes a real crack at better defining business method or software patents. While there are certainly flaws in the patent process that merit attention (the long delays in patent reviews, first to file vs. first use, and the lack of funding for the USPTO), any true patent reform act will alter patent rules to better accommodate software inventions rather than only addressing the mechanics by which patents are reviewed and approved. That’s a pretty incredible graph. If everyone in the economy has the information on that graph and acts rationally upon it, then the existence of software patents is actually a radical disincentive for inventors.